How will frequency regulation and load management be monetized? the absolute (rather than net) amount of energy injected or withdrawn. These payments are intended to cover the range of costs incurred in providing frequency regulation service, e.g., operation and maintenance costs, and loss of potential revenue from foregone sales of electricity. The payment for capacity is essentially an option payment to the resource to keep a certain amount of capacity out of the energy or other markets in order to provide frequency regulation service, typically based on a market clearing price per MW of capacity sold. ISO-NE, NYISO, MISO, California ISO, and PJM incorporate into this payment the opportunity cost of foregone energy sales incurred by a resource that provides frequency regulation service. However, ISO-NE and PJM do not apply the opportunity cost payment uniformly to all cleared resources, but rather make ex post resource-specific opportunity cost payments. Compensation for frequency regulation service also includes payments or charges for the net energy the resource injects into or withdraws from the system. All RTOs and ISOs currently provide a payment for the net energy injected by a resource providing regulation service during the operating hour, calculated as the amount of energy injected less energy withdrawn multiplied by the real-time energy price. Accuracy of performance can also be incorporated into payments for frequency regulation service. Currently, NYISO incorporates accuracy into its compensation for frequency regulation service through a penalty that reflects the accuracy with which the resource follows its dispatch instruction. This is done through a performance index that tracks how accurately a resource follows the dispatch signal. On October 20, 2011, FERC issued a final rule establishing a two-part market-based rate compensation methodology for the provision of frequency regulation service in RTO and ISO markets. The cost of providing regulation service generally is borne by customers serving load in the balancing authority area where the relevant resources are located. At present, different markets have different methods for compensating providers of frequency response service. Order No. 755 reforms the approach used to compensate these suppliers. ACE – Area Control Error – Measures frequency deviations and interchange power imbalance. A measure of the quality of operation of the grid. ACE must be kept within grid operating requirements. Ancillary Services - Balancing services used to balance generation and demand in tightly limited situations to maintain the alternating current (AC) system frequency of 60 Hz. Energy storage is perfectly suited to provide this service by absorbing electric energy (charging cycle) whenever there is too much generation for a given demand and by injecting electric energy into the power grid discharging cycle) when there is too little generation. Traditionally, these services have been performed by conventional gas or steam turbine technologies. But rather than varying the torque of large rotary turbo-machinery on a second-by-second basis, electrochemical EES is much better suited to quickly respond to the grid needs. AGC - Automatic Generator Control - Frequency regulation service is the injection or withdrawal of real power by facilities capable of responding appropriately to a transmission system operator’s AGC signal. In the Ancillary Services DR market, end-use customers are allowed to bid load curtailments in ISO/RTO markets as operating reserves. Accepted bids are paid the market price for committing to be on standby. In order to participate in ancillary-service markets, end-use customers must be able to adjust load quickly during a DR event. The response requirement depends on the nature of the event and the type of reserve being supplied. Loads typically have a very short response time, usually specified in minutes, rather than in hours. These short timeframes and program requirements limit the type of resources that can participate. End-use loads that qualify for participation as an ancillary services option could include large industrial processes that can be curtailed safely and quickly without harm to equipment. Examples of loads are air products or electric arc steel furnaces, large water pumping load, or remote automatic control of appliances such as air conditioners. 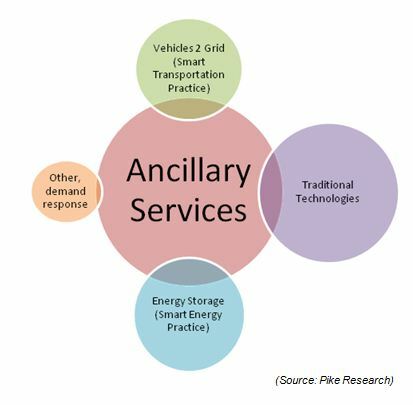 End-use customers participating in the ancillary services market receive a capacity payment for committing loads to be on standby. The capacity payment is based on the market clearing price for capacity (MCPC). If load curtailments are needed, and they are called by the ISO/RTO, participants are paid the spot-market energy price. There is typically a higher minimum size for reductions and customers are required to install advanced real-time telemetry because of the stringent program requirements. End-use loads that qualify for participation in the ancillary service option require capability to respond to an event notification that is going to occur within 30 minutes of the notification. Dispatchability - The ability of a given power source to increase and/or decrease output quickly on demand. This should be contrasted with certain types of base load generation capacity, such as nuclear power, which may have limited capability to maneuver or adjust their power output, or intermittent power sources such as wind power which cannot be controlled by operators. The time periods in which dispatchable generation plant may be turned on or off may vary, and be considered in time frames of minutes or hours. In general, when a resource submits its frequency regulation bid to the RTO or ISO, the bid is typically required to include its ramp rate in MW/min, its cost per megawatt-hours (MWh) of ramping ability, and the total capacity it is offering for frequency regulation. The resource’s total amount of capacity is based on and limited by its ability to ramp up or down. For example, a resource with a relatively large amount of capacity, but a relatively slow ramp rate would be limited in how much capacity it could offer as frequency regulation capacity. If the resource can ramp one MW per minute, it would only be able to offer five MW of regulation capacity (for a five minute dispatch) regardless of its total capacity. On the other hand, a smaller capacity, faster ramping resource might not face such a constraint. For instance, a storage device that can hold a 20 MW charge and ramp at 10 MW per minute, could offer its full 20 MW of capacity for five minutes. Dispatchability - The ability to provide a DR-inducing signal within a limited timeframe. Some argue that dispatchability is a requirement of a DR option. Time-of-use (TOU) rates are sometimes considered a demand-response option. TOU rates are non-dispatchable and produce a consistent reduction in peak demand. FERC Order 755 - Issued October 20, 2011 - Pursuant to section 206 of the Federal Power Act (FPA), ;the Commission is revising its regulations to remedy undue discrimination in the procurement of frequency regulation in the organized wholesale electric markets and ensure that providers of frequency regulation receive just and reasonable and not unduly discriminatory or ;preferential rates. Order No. 755, generators or other entities providing this service will be compensated in a two-part structure. Capacity Payment - Regulation service providers will receive a capacity payment reflecting the opportunity costs of the marginal resource providing frequency regulation service during the settlement period. This approach acknowledges that a frequency response resource must hold some of its capacity in reserve to provide frequency regulation service when such service is needed, and therefore the resource forgoes the revenue it could otherwise earn through energy market sales. Order No. 755 also allows for the recovery of inter-temporal opportunity costs, such as costs incurred by an energy storage device that must provide frequency response service at a time of day when it would be more cost-effective for it to buy energy to recharge the storage device. Order No. 755 leaves the specific methods for calculating such opportunity costs to individual regional markets, explaining that the operators of the separate regional organized markets are "in the best position to perform accurate cross-product opportunity cost calculations." With regard to inter-temporal costs, Order No. 755 requires that such costs be verifiable, but it allows individual regional market operators to determine whether these costs should be determined by the ISO or RTO or by market participants. Performance Based - The second component of regulation service compensation is "performance-based" and will reflect the amount of the up or down movement a resource provides in response to the system operator's dispatch signal and the resource's accuracy in responding to the dispatch signal. This approach accounts for the fact that a resource with faster ramping capability can provide a greater amount of capacity into the regulation market than can a slower-ramping resource. Frequency Regulation - Electric frequency must be maintained very close to 60 hertz (Hz), or cycles per second (50 Hz in Europe and elsewhere). When the supply of electricity exactly matches the demand (or "load"), grid frequency is held at a stable level. Grid operators, therefore, seek to continuously balance electricity supply with load to maintain the proper frequency. They do this by directing about one percent of total generation capacity to increase or decrease its power output in response to frequency deviations. ISO - Independent System Operator - In a deregulated marked, although utilities retain the ownership of transmission lines, they no longer control access to them. This responsibility has been transferred to a non-profit organization called an "Independent System Operator" which controls transmission of all electricity in the region. funded by a grid management charge approved by FERC and paid by generators and load serving entities within the RTO/ISO’s balancing authority. It operates the electric transmission acilities under its authority in compliance with NERC approved mandatory reliability standards. In so doing, it provides nondiscriminatory access to transmission services for all qualified market participants. Historically, some RTO/ISOs evolved from power pools, for example PJM, while others were created by state legislation which also mandated electric industry restructuring, for example CAISO, or through other voluntary associations, such as the Midwest ISO. An RTO/ISO designs and administers within its balancing authority several types of auction markets, including day-ahead and real-time wholesale spot markets (including five minute dispatch) for electric energy and ancillary services, and forward markets for financial transmission rights; several also operate forward markets for capacity. These markets are characterized by transparent prices and have both ex ante and ex post rules that support workably competitive market outcomes. Regulation Ancillary Service – The continuous matching of supply with demand in a control area. This would represent an economic opportunity for Vehicle to be available for short bursts of charge and discharge. Power plants provide regulation today, but they have slow response, low efficiency, energy and economic. VAR Support - Reactive power support can be provided on either a unitary or small-system basis, or as a secondary overlay application for a full-scale 20 MW frequency regulation power plant. For industrial and commercial end users, potential benefits include lower fees from utilities resulting from improvement of power factor levels that would otherwise fall below specified minimums, as well as higher power quality for sensitive industrial and commercial applications. For grid operators or utilities, potential benefits include the ability to defer investments in transmission and/or distribution infrastructure. On October 20, 2011, pursuant to section 206 of the Federal Power Act, FERC revised its regulations to remedy undue discrimination in the procurement of frequency regulation in the organized wholesale electric markets and ensure that providers of frequency regulation receive just and reasonable and not unduly discriminatory or preferential rates. Frequency regulation service is one of the tools regional transmission organizations (RTOs) and independent system operators (ISOs) use to balance supply and demand on the transmission system, maintaining reliable operations. In doing so, RTOs and ISOs deploy a variety of resources to meet frequency regulation needs; these resources differ in both their ramping ability, which is their ability to increase or decrease their provision of frequency regulation service, and the accuracy with which they can respond to the system operator’s dispatch signal. The Commission found that current frequency regulation compensation practices of RTOs and ISOs result in rates that are unjust, unreasonable, and unduly discriminatory or preferential. Specifically, current compensation methods for regulation service in RTO and ISO markets fail to acknowledge the inherently greater amount of frequency regulation service being provided by faster-ramping resources. In addition, certain practices of some RTOs and ISOs result in economically inefficient economic dispatch of frequency regulation resources. The primary economic benefit that some commenters expect to see is reduced costs of procuring frequency regulation capacity, with a secondary benefit of reduced energy costs. fFaster-ramping resources are able to provide more frequency regulation service from the same amount of frequency regulation capacity because faster-ramping resources can provide more ACE correction in real-time. Control Frequency - Provides frequency regulation to maintain the balance between the network's load and power generated. Provides stability, VAR support, power quality and transfer-leveling, and reliability. Faster Ramping Resources Cost Less - The final rule serves to remove barriers to the participation of faster-ramping and more accurate resources in the frequency regulation markets. The utilization of these more accurate resources will lead to reductions in the amount of regulation capacity that each balancing authority must procure – savings which can then be passed on to consumers. Furthermore, the rule will also allow the mostly thermal generation fleet that currently provides regulation to instead more efficiently operate in the energy markets at their optimum heat rates, where they can submit lower offers to supply energy and thus further lower costs to consumers. Because the energy market is much larger than the regulation market, this is where there may be greater savings. Improved Reliability - The final rule should enhance reliability as it incents new resources to come online and provide system operators in the ISOs and RTOs with additional tools and flexibility to manage the grid. As I have repeatedly indicated, we are asking our aging grid infrastructure to do more and more as regional electricity markets expand and we seek to transmit power over long distances from location constrained resources. We need to make sure that the operators of the grid are prepared to deal with these challenges with tools like the enhanced regulation market design we are directing today. Reduced Emissions - The final rule will result in an overall reduction in emissions from the generation fleet. Some of the new resource technologies that are faster and more accurate produce no emissions themselves. Further, the mostly thermal generation that traditionally has provided regulation will now be able to bid their capacity into the energy markets at their optimum heat rates. This will enable the thermal generators to maximize their efficiency, which in turn will reduce their emissions. The two-part rate is likely to be administratively-determined. There is no straightforward way for both the mileage payment and the capacity payment to be established through competitive offers. Therefore, the subjective judgment of the Commission and the operators of RTOs and ISOs will replace market forces in determining the value of frequency regulation service. The performance payment will increase payments that must be recovered through uplift, complicating existing settlement procedures and efforts to reduce uplift. Penalize Existing Technology A performance payment will unduly discriminate against existing technologies that could respond faster but for the presence of barriers that have not, to date, presented themselves as obstacles. These barriers include the use of static ramp rates that reflect typical performance under all conditions rather than peak performance under conditions that exist at a point in time. Potential for Manipulation - Multi-part offers require complex rules to deter market manipulation because it is difficult to differentiate between legitimate and illegitimate bidding behavior. Regulatory Treatment of Storage & Asset Classification - Today's regulatory structure and utility processes disfavors energy storage. Storage is neither supply nor demand in a traditional sense and existing regulatory framework is not set up to manage it. It is a matter of debate whether the cost of energy storage technologies utilized to shift transmission utilization to match capacity should be a generation or a transmission asset because of its multifaceted implications for business models, sources of financing, and regulatory cost recovery. Energy Storage is a transmission application because it is directly linked to the transmission system and its operation, without any bias towards its classification as such for regulatory or business model questions. Storage can also be used for energy price arbitraging and production leveling, which are normally generation functions and which developers prefer to perform on a merchant basis so that they can access market prices. Also, the operator takes ownership of the energy in redelivering it which isn’t a transmission function. We need appropriate regulatory, market, and incentive treatments to encourage storage in support of renewable energy. When Storage is used in a multi-purpose application (as at a substation), it is unclear how to allocate costs and benefits for cost recovery. Because these benefits address different functions (generation vs. transmission), it may be difficult to measure the different benefits and allow for full cost recovery based on these benefits. Cost Competitiveness - High cost of energy storage technologies due to the small scale of production. The costs of energy storage options need to be compared to other options, including the construction of new transmission infrastructure. Value Not Monetized - Failure of the current marketplace to monetize the true value of storage. Storage has over 30 different elements of value and, right now, very few of those elements of value are monetized in the marketplace. Market Information - Information on energy balance, requirements for ancillary services and related market values may not be available. In the case of longer term storage (minutes to hours) for energy arbitrage, load following and ramping, market information on both the current value of energy and the expected future value will be required to effectively schedule changing and discharging. Since all storage systems will have both a capital and an operational cost component, its dispatch will depend primarily on capacity and on energy value. Also the capacity and energy limits of the storage systems will need to be communicated back to either a dispatcher or aggregator. Communications - In the case of short-term storage (seconds to minutes) for ancillary services, including frequency regulation, reactive supply and voltage support, requires fast and secure communications that allow for automatic control of the resource. Battery Storage (See my Blog Article - Battery Storage) - Utilities typically use batteries to provide an uninterruptible supply of electricity to power substation switchgear and to start backup power systems. However, there is an interest to go beyond these applications by performing load leveling and peak shaving with battery systems that can store and dispatch power over a period of many hours. Batteries also increase power quality and reliability for residential, commercial, and industrial customers by providing backup and ride-through during power outages. EDLC - Electrochemical Double Layer Capacitors - (Also known as supercapacitor, supercondenser, pseudocapacitor, or ultracapacitor) (See my blog article - Supercacitors) Store energy directly as charge. An EDLC is an electrochemical capacitor with relatively high energy density. Compared to conventional electrolytic capacitors the energy density is typically on the order of hundreds of times greater. In comparison with conventional batteries or fuel cells, EDLCs also have a much higher power density. Flywheel (See my Blog Article) – Flywheels are designed to smooth out transient fluctuations in load and supply, Changing power output causes greater wear and tear on equipment, and fossil generators that perform frequency regulation incur higher operating costs due to increased fuel consumption and maintenance costs. They also suffer a significant loss in "heat rate" efficiency and produce greater quantities of CO2 and other unwanted emissions when throttling up and down to perform frequency regulation services. SMES - Superconducting magnetic energy storage systems (See my blog article SMES) store energy in the magnetic field created by the flow of direct current in a superconducting coil which has been cryogenically cooled to a temperature below its superconducting critical temperature. A typical SMES system includes three parts: superconducting coil, power conditioning system and cryogenically cooled refrigerator. Once the superconducting coil is charged, the current will not decay and the magnetic energy can be stored indefinitely. The stored energy can be released back to the network by discharging the coil. The power conditioning system uses an inverter/rectifier to transform alternating current (AC) power to direct current or convert DC back to AC power. Supercapacitors are DC energy sources and must be interfaced to the electric grid with a static power conditioner, providing 60-Hz output. A supercapacitor provides power during short duration interruptions and voltage sags. By combining a supercapacitor with a battery-based uninterruptible power supply system, the life of the batteries can be extended. The batteries provide power only during the longer interruptions, reducing the cycling duty on the battery. Small supercapacitors are commercially available to extend battery life in electronic equipment, but large supercapacitors are still in development, but may soon become a viable component of the energy storage field. While Order No. 755 applies only to organized ISO and RTO markets, FERC may act to broaden its application. On June 11, 2011, FERC issued a Notice of Inquiry ("NOI") seeking comment on whether the cost-based compensation methods for frequency regulation in regions outside of organized markets should be adjusted to address the same issues addressed in Order No. 755. Third-Party Provision of Ancillary Services; Accounting and Financial Reporting for New Electric Storage Technologies, Notice of Inquiry, 135 FERC ¶ 61,240 (2011). In the NOI, FERC sought comments on different frameworks under which the speed and accuracy of frequency regulation resources might be appropriately valued in non-RTO and non-ISO markets. The matter is pending before FERC. CPUC - Demand Response Cost-Effectiveness Protocols - Final (MS-Word) - These protocols have been developed with the understanding that DR is in a transitional period. Historically, DR was largely employed for reliability purposes during system emergencies in the form of interruptible programs for large industrial customers, which could be triggered when an ISO would otherwise have to shed load during a system emergency or when a utility was faced with a serious distribution system emergency. However, the deployment of advanced metering technology and development of new energy markets is enabling greater use and flexibility of demand response by all types of customers. Increasingly, customers are able to manage their loads to provide different levels of load reduction in response to price signals or other incentives. These load reductions provide value to the grid not only during emergencies, but also during times of high energy prices or in the ancillary services market. As a result, the methods used to measure the costs and benefits of demand response must be flexible enough to capture these emerging benefits. I believe the FERC order states the price must be market-based and so will not be able to be administratively set- which is certainly a challenge.